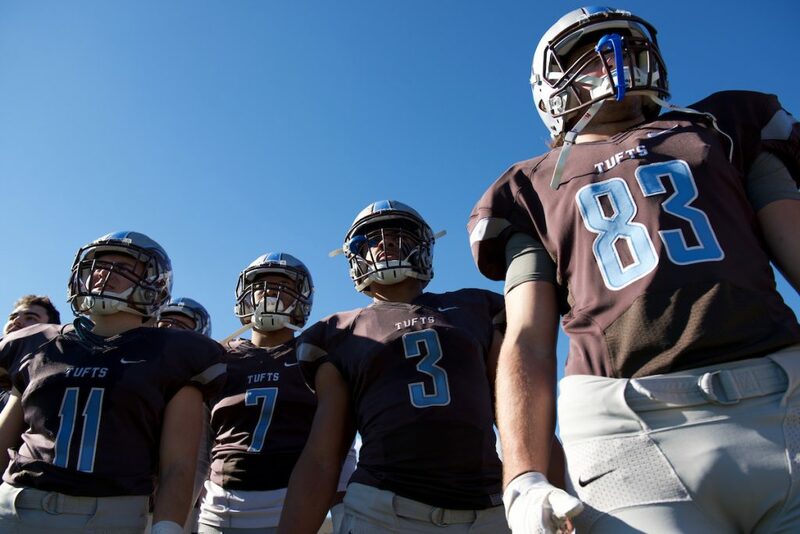 Expectations reached an all-time high for Tufts football this season. With senior tri-captain running back Chance Brady returning as the reigning NESCAC Offensive Player of the Year and a young defense that added fresh talent to the roster, the Jumbos promised a lot of potential. The program is just three years removed from the 31-game losing streak that plagued its reputation. The past two successful seasons have made that streak feel like a distant nightmare and highlighted the program’s recent stretch of rapid improvement. The Jumbos set lofty goals for the 2016 season and more or less met their expectations, going 7-1 — the program’s best record since 1998 — and finishing second in the NESCAC. The season started out with a pair of close home wins, first over Wesleyan and then over Bates. The Wesleyan game was a testament to the team’s resilience, as it fell behind early and entered the fourth quarter down 11 points only to seize the win after a pair of fourth-quarter touchdown runs from Brady. Looking back on his performance in the game, Brady said he took pride in the Wesleyan win in particular. The Bates game, like several of the Jumbos’ home games this season, was plagued by nonstop rain. Tufts took advantage of the inclement weather, relying on the team’s hard-nosed running game as well as mobile sophomore quarterback Ryan McDonald, who saw his first significant playing time in the contest. McDonald and senior quarterback Alex Snyder split time over the rest of the season. McDonald’s willingness to tuck and run gave the Jumbos an additional threat in the backfield and opened up lanes for Brady, who had previously seen defenses overcommit to stop him. McDonald said that sliding into the lineup as a regular fixture was a big adjustment. The Jumbos traveled to Bowdoin and won a 41-21 contest in what was one of the most offensively balanced games of the year. Snyder, McDonald and sophomore quarterback Ryan Hagfeldt combined for 246 yards in the air and McDonald added 146 on the ground, for the Jumbos’ total 505 yards on offense. The fourth game of the season against Trinity was Tufts’ only loss of the season. Despite a late run to pull within eight, the Jumbos could not overcome the 27 points they allowed in the second quarter and fell 36-28. The Bantams boasted the NESCAC’s best offense this season, 38.1 points per game. The Tufts defense, which had been solid all season, made a series of statements against Tufts’ next three opponents. Against Williams, Amherst and Colby, Tufts’ defense allowed 16, 10 and 12 points, respectively. The game against the Mules was perhaps the most impressive of the three, as the Jumbos played their sloppiest first half of the season, committing multiple mistakes on special teams. Colby repeatedly was set up deep in Jumbo territory but was denied a touchdown all day. Tufts clinched sole possession of second place in the conference in its final game, defeating Middlebury 48-35. Brady, in his final game as a Jumbo, turned in one of the best performances of his decorated career. He ran for 185 yards and three touchdowns on the ground, adding two passes for 73 yards and two more touchdowns. The Jumbo defense held the explosive Panthers’ offense, which ranked second in the NESCAC in scoring, to just seven first-half points. Though the Panthers mounted a comeback, they fell short of stealing the game. The game was a culmination of Brady’s record breaking season. He is now Tufts’ leader in single game touchdowns (five), touchdowns in a single season — both rushing (17) and total (19) — as well as rushing yards in a season (1099) and career rushing yards (2692). Brady was honored as the NESCAC Offensive Player of the Year and as the New England Football Writer’s Association Div. III Gold Helmet recipient, both for the second straight season. Named to the All-NESCAC first-team alongside Brady were senior center Jack Price, senior kicker Willie Holmquist, junior defensive tackle Doug Harrison, sophomore corner Tim Preston and first-year linebacker Greg Holt. Preston led the league in interceptions for the second straight year with five and Holt’s 98 tackles also paced the NESCAC. Holt was selected as the conference’s Rookie of the Year. Brady’s 1099 rushing yards ranked first in the NESCAC and McDonald posted 647 rushing yards for third. The duo represented the most dynamic ground attack in the NESCAC, with an offensive line that worked hard to push defenders off the line of scrimmage and open holes for the pair of elusive runners. Brady credited the struggles that came in his 0-8 first-year season with helping to develop a toughness within the team. The Tufts defense finished fourth in points allowed. Though junior defensive ends Zach Thomas and Micah Adickes did not combine for the astounding 15 sacks that they did during the 2015 season, the defensive line play reached another level this season. The team played more fundamentally sound football and allowed 85 fewer passing yards per game this season as compared to last season. The leader of the defense, tri-captain linebacker Stearns credited his teammates and their hard work for the growth of the young squad. This year’s senior class is a large one for the Jumbos, who are set to graduate a handful of offensive starters including Brady, Price, wide receivers Ben Berey and tri-captain Mike Rando, as well as offensive linemen Alex Kim and T.J. Muzzonigro, among others. The defense, however, remains largely intact and while this year’s seniors will be missed, Civetti is confident his team will continue to improve on its success.